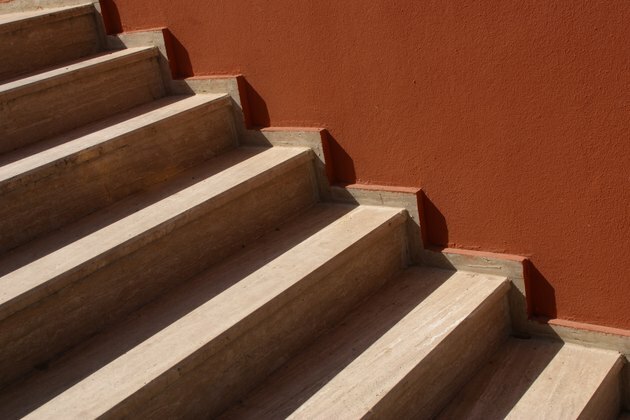 Standards for safe stairs are a major preoccupation for building regulations. Falls on stairs kill 4,000 people a year in the United States, and another 2 million people are injured. The riser-tread relationship is a significant factor in stair safety. Stair dimensions are calculated using a ratio for the proportion of the riser to the tread that is determined to be safe and comfortable. Interior stairs have a different ratio than exterior stairs. Exterior risers and treads are lower and wider than interior stairs. The dimensions of the tread and riser determine the angle of a staircase. Treads and risers are calculated to meet a ratio so that as the riser becomes steeper, the tread decreases in width. Stair dimensions are regulated in building codes, expressed in terms of minimum and maximum tolerances. In 2003 the International Code Council recommended that treads shouldn't exceed 10 inches and risers shouldn't be higher than 7 3/4 inch. Building regulations are variable, but don't deviate much from that standard. The typical interior stair dimension is calculated as the formula, riser (R)+ tread (T) = 17 inches minimum, or 18 inches maximum, not including the nosing. The nosing is the projecting edge of a tread. Risers can be too low and treads too long for comfortable use of the stairs; a riser that's 7 inches is considered an ideal height with a 10-inch wide tread. The riser may be set to a different height within the maximum, but the calculations are based on the same tread-riser ratio. Exterior stairs are built to a different ratio than interior stairs. Outdoor stairs are viewed as potentially more hazardous because of rain and snow. A riser higher than 7 inches is not recommended outside, though interior stair dimensions can be higher than that. The ratio for exterior stairs is two risers + the tread = 26 inches. The optimum riser for exterior stairs is 6 1/2 inches, making the tread 13 inches wide. Every riser and tread has to be equal; adjustments should be made with the calculator, not by shifting the dimensions of one or two stairs. Risers and treads are calculated by finding the total rise, from the landing where the bottom stair rests, to the upper finished floor. The total rise is divided by the desired riser height. When the result is a fraction, round up or down to the nearest whole number. That number is divided by the total rise to set the height of the riser.